This is something you could find yourself saying if you have an Amazon Echo in your home. Two special Alexa Skills in the skill store will keep you up to date with what’s happening at your local DCDL branch. These first-of-their-kind skills give patrons another incredibly easy way to stay up to date with the fantastic and entertaining programs provided for all ages at the Delaware County District Library. Avneet Sarang from Pellucent Technologies in Powell developed the Alexa Skill in spring 2017. Sarang is a DCDL patron who uses the Echo regularly for news and community updates. 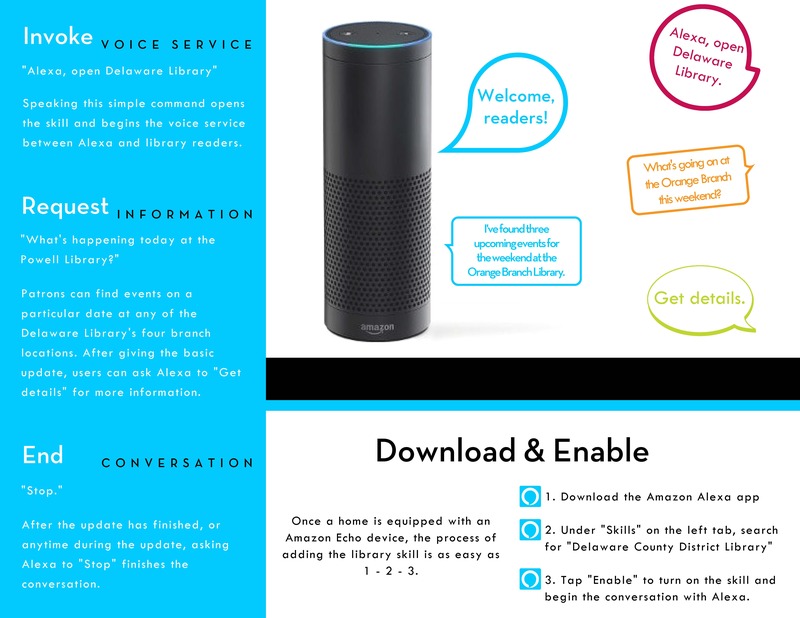 Echo users can search for “Delaware County District Library” on the Alexa Skills tab of their app, enable it online at a computer, or just ask Alexa to "enable the Delaware County District Library Flash Briefing Skill" or "enable the Delaware County District Library Skill." · What’s happening this weekend at the Ostrander Library? · Are there any events tomorrow at the Delaware Library? · Is there anything happening at the Orange Library on August Tenth? · What’s going on today at the Powell Library? Alexa then answers the questions with specific information regarding program titles and times at the branch requested. Everything from children’s storytimes to adult book clubs and more will be at users’ request. Watch the instructional video below to see how it works, or read more here.